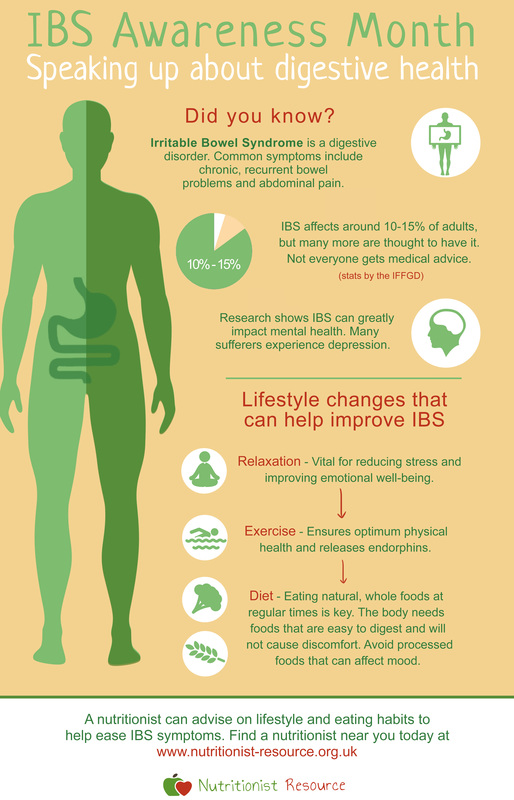 April marks IBS Awareness Month, so we designed a special infographic to highlight lifestyle changes that can help tackle symptoms. In 1997, the International Foundation for Functional Gastrointestinal Disorders designated April as IBS Awareness Month. During this time, the nation is encouraged to focus their attention on a number of health messages surrounding digestive problems and the importance of seeking treatment. Here at Nutritionist Resource we wanted to create an infographic that brought the key facts and characteristics of IBS to light. The digestive disorder is a serious condition that is surprisingly common, but can be managed effectively with the right help. We have listed various lifestyle changes that can make a big difference to those suffering from IBS. Many find seeing a nutritionist particularly helpful for improving their quality of life and reducing the impact the condition has on their health and well-being. 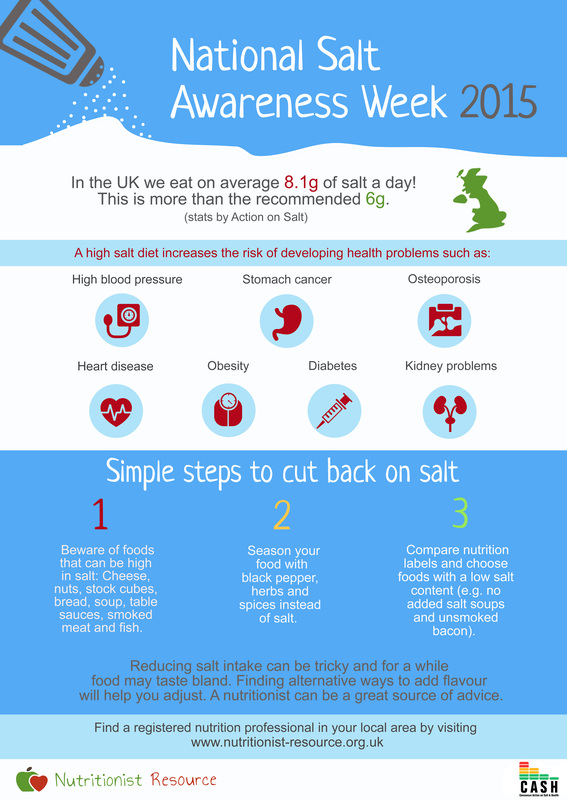 Nutritionist Resource sheds light on the importance of a low-salt diet with a brand new infographic. National Salt Awareness Week is an annual event pushed by Action on Salt to encourage people to take notice of their salt consumption and make healthier food choices. Unfortunately, a number of adults and children in the UK are eating more than the recommended 6g of salt a day. This is putting their health at serious risk. Many people are unaware of how much salt their food contains, and do not take time to check food labels or look for alternative low-salt options. Nutritionist Resource’s infographic highlights the importance of being more aware of salt content in foods, and how to make healthy lifestyle changes to avoid consuming over the recommended daily amount. Nutritionist Resource's infographic helps raise awareness of the nationwide obesity challenge. 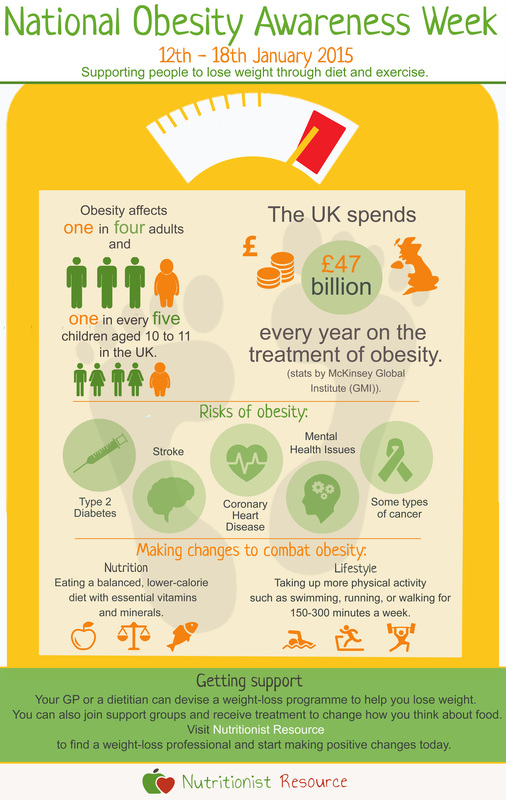 Every January, National Obesity Awareness Week sheds light on the growing problem of obesity in the UK. Coordinated by the National Obesity Forum, the event aims to raise awareness of how we, as a nation, can work together to bring about urgent action. Obesity is costly and detrimental to our health, yet in the UK one in four adults and one in every five children (aged 10 – 11) are obese. Unfortunately there tends to be little information available to those who are overweight but want to do something about it. Nutritionist Resource’s infographic aims to highlight the health risks of obesity and ways in which people can turn their lives around for the long-term. Nutritionists from Nutritionist Resource offer advice for BBC News online. 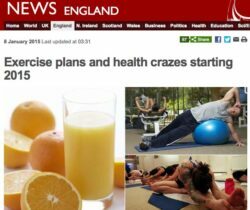 Today BBC News online ran a feature about the various health crazes set to be big in 2015, including health apps, hot yoga and pole dancing. The piece also discusses which diet trends we’ll be seeing in the coming year. For this section, two of our members offered their advice regarding dietary changes for 2015, including why making small but permanent changes is key and why blending may be more beneficial than juicing. To read the full article, please head over to BBC News. 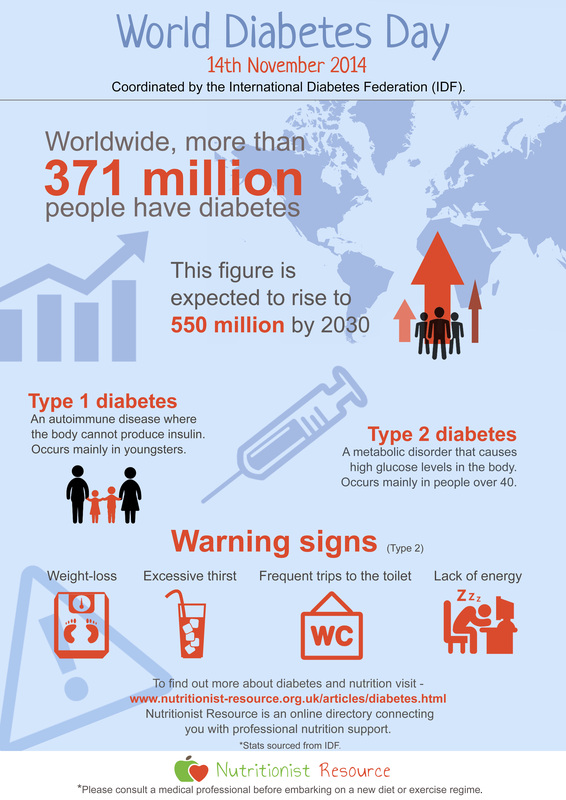 In light of World Diabetes Day, Nutritionist Resource designed an infographic to help raise awareness of the disease. Every year the International Diabetes Federation (IDF) coordinates a day dedicated to raising worldwide awareness and advocacy initiatives to help tackle diabetes. Diabetes is a common health condition, but it is becoming increasingly more prevalent. According to recent statistics, globally there are more than 300 million people living with diabetes. In the UK alone, 3.2 million have been diagnosed. Of these diagnoses, 90% of people have type 2 diabetes, while 10% have type 1. Type 2 diabetes can be easily prevented by making healthy lifestyle choices, but a combination of factors such as poor diet, being overweight, a family history and lack of exercise can increase the risk.